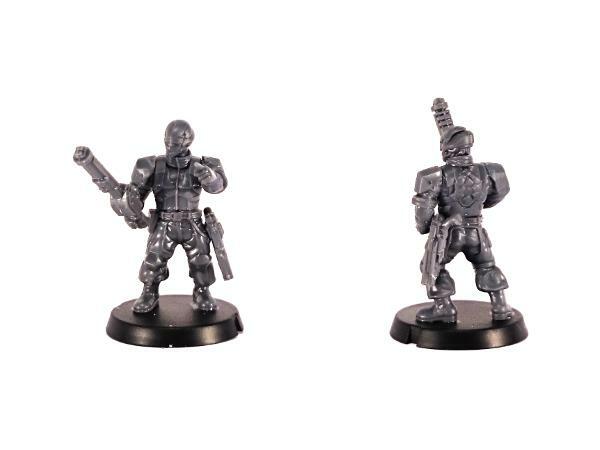 The new Faction Expansion Sprue saw the addition of new units to the game for both the Karist and Epirian factions, with additional components to add to the original plastic kits. This seemed like a great opportunity to expore the versatility of these kits, by looking at different ways to build the new units. So to kick things off, we'll be looking at the Epirian Suppression Team. 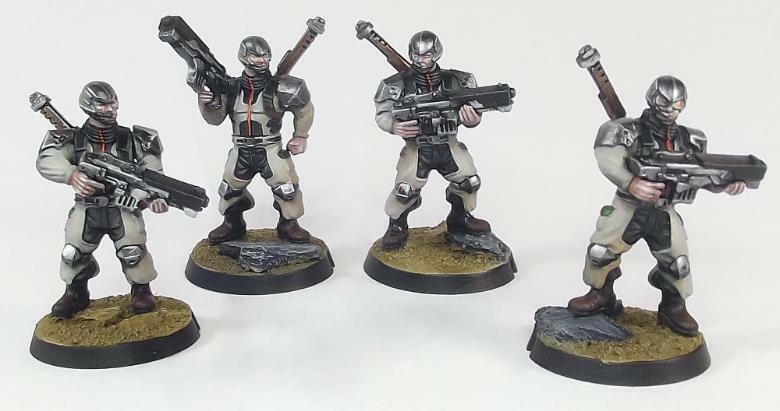 These doughty warriors take the field armed with the standard Epirian Maglock weapons, but also have the option to replace either pistol or rifle with a Shock Baton or Shock Maul. 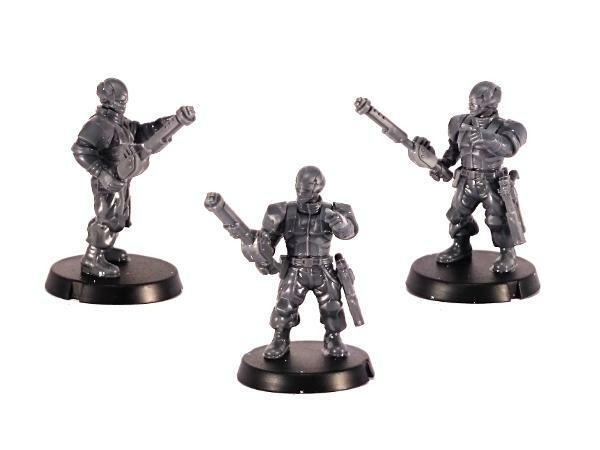 The studio models shown above were assembled with the Shock weapons slung on the models' backs, which is the easiest and quickest way to assemble them, particularly if you want to arm them with their rifles. This is simply a matter of gluing the Baton or Maul straight to the Contractors' back plates. We would assume that they're held there with a magnetic latch system, or some similar thing. An easy alternative is to use one of the Contractor rifle arms to hold the Shock weapon. Several of the rifle arms have the trigger finger fairly close to the other fingers, and so they don't look too out of place holding the Shock weapon handle. You can also gently bend the trigger finger in to reduce the gap even further (The Shock Baton does have a chunkier grip than the Maul, so if you're having trouble getting it to fit, you can shave down the sides of the grip a little). You can slice the arms at the wrist and/or just under the rolled sleeves on the upper arm and reposition to give some more interesting poses. On the Maul-equipped model below, the right arm has been swivelled just under the rolled sleeve to move the hand outwards from the body, and on the other model one of the rifle support arms has been used with the hand rolled at the wrist to give him an 'at-rest' pose with the baton resting on the ground. 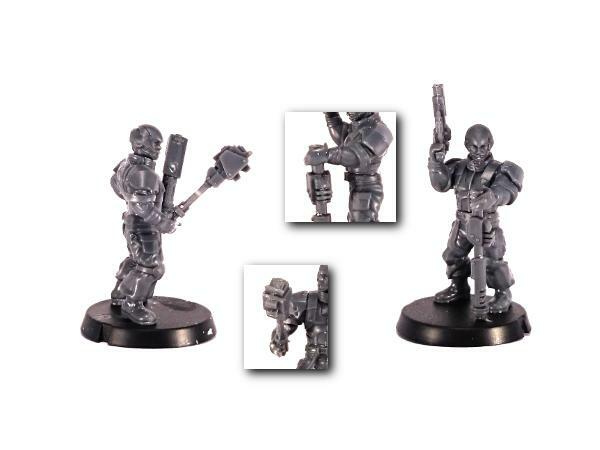 You can also use the open Karist hand on the Expansion sprue to replace one of the rifle hands. 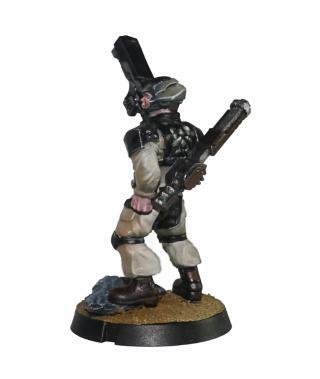 On the model below, I've used that hand for the Shock Baton, and swapped the pointing hand off the Karist arm on the sprue onto one of the Epirian rifle arms. 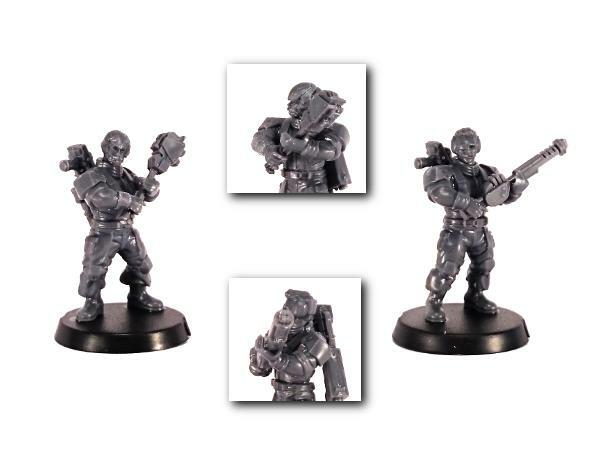 The end result is a model wearing Karist gloves, but with the Epirian arms they still look quite distinct from the Karist models. The team members' ranged weapons can be dealt with several different ways. 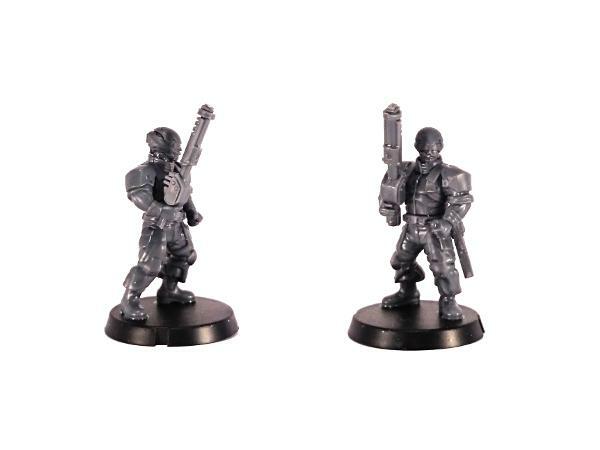 For models equipped with pistols, you can use the pistols and weapon arms from the Contractor sprue, of course. However, if you've used the right arm for the Shock weapon, an easy alternative is to glue the pistol onto the model's belt, or to use the legs from the Bot Handler sprue and hang the pistol off the strapped pouch on the thigh. For either of these, it's a good idea to cut off the revolver drum on the side of the pistol that will attach to the model, to allow it to sit more flush against the leg. For rifle-equipped models, you can reverse the idea from the studio models, and mag-lock the rifle to the model's back. 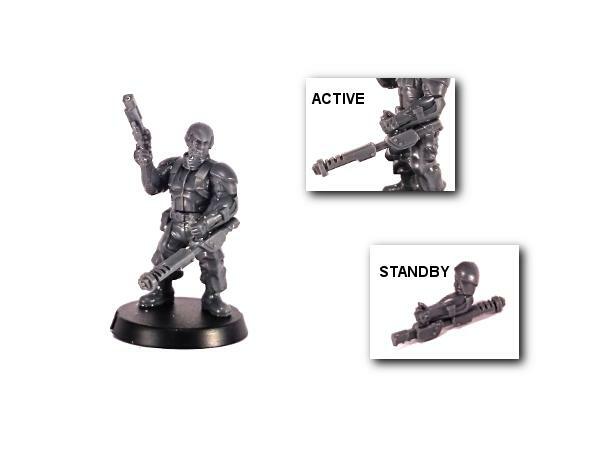 Or you can use the rifle support arms to balance the rifle against the model's hip, as below. With the rifle safely stowed on the model's back, you can use the rifle arms to create a two-handed grip on the Shock weapons, as below. Depending on the specific arm pairing you go for, a little wrist-repositioning can be necessary to get these sitting just right. For a slightly more out-of-the-box alternative, the below model was assembled using the arms from the Bot Handler sprue, instead of Contractor arms. For the Shock Baton, I cut off the Handler's underslung grenade launcher, chopped the heatsink part off the back of the Baton, and glued it in place running along the forearm. This can be positioned pointing forwards for an 'Active' pose, or reversed for a 'Standby' or 'At-Rest' pose. 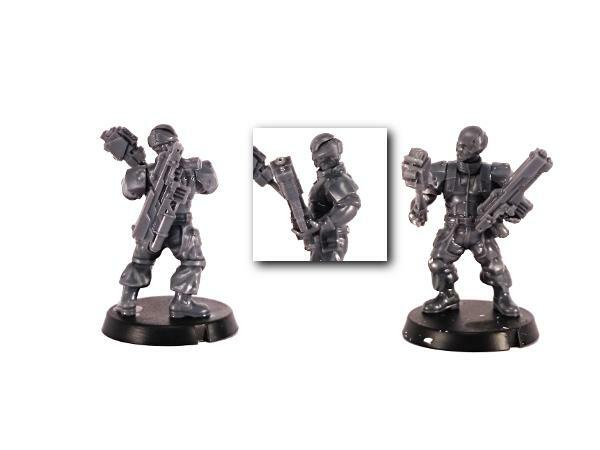 You can pick up the Faction Expansion Sprue in the Maelstrom's Edge Online Store here. As you can see, there are a lot of possibilities with these models, thanks to the ease of assembly and conversion with the plastic models. I've only just scratched the surface with the builds shown here. Feel free to share what you come up with on the Comm Guild Facebook page (https://www.facebook.com/groups/MaelstromsEdge) - it's always great to see how others put their own spin on the model range! Next up, I'll be taking a look at the Cybel Glaive-equipped Karist Praetorians. Stay tuned!